WASHINGTON — In only a few minutes on national television, the beatings of civil rights marchers by police on the Edmund Pettus Bridge in Selma, Alabama, dragged the inhumanity of Southern segregation into America’s living rooms as never before. The images were unforgettable: police tear-gassing kneeling protesters, clubbing them and attacking them on horseback behind a civilian posse. Five decades later, many recalled that moment when police lobbed tear gas at protesters in Ferguson, Missouri, after the police shooting death last year of black 18-year-old Michael Brown. President Barack Obama and some surviving marchers are going back to Selma this weekend to commemorate the 50th anniversary of that “Bloody Sunday” assault, and to talk about how the country has — and has not — changed since then. Several Ferguson protesters also plan to go to Selma, hoping to ensure that more Americans will draw parallels between yesterday’s and today’s struggles. “It is clear that the struggle continues,” said human rights attorney Nicole Lee, who was in Ferguson during the unrest after police decided not to charge officer Darren Wilson in Brown’s death. A grand jury declined to indict Wilson, and the Justice Department said Wednesday that it also would not seek to prosecute him. It did issue a scathing report that called Ferguson’s law enforcement practices discriminatory and unconstitutional. Similar things were said about Selma after the police killing of Jimmie Lee Jackson, 26, who died a few days after being shot in the stomach by Alabama state trooper James Bonard Fowler while trying to protect family members during a melee following a voting rights protest in February 1965. A grand jury declined to indict Fowler. Rep. John Lewis, then a student activist who was severely beaten in Selma, sees parallels between the 1965 marches and the #BlackLivesMatter movement that sprang up after Brown’s death. He also sees a major distinction. “The only thing that is so different (is that) today, I don’t think many of the young people have a deep understanding of the ways of nonviolent direct action,” said Lewis, D-Ga.
Other Selma veterans say they fear their sacrifices are being wasted by those whose failure to vote leads to lack of representation in government and on police forces. “Racism never went anywhere. Racism just took a nap, and when it woke up, we were watching … all those stupid reality shows. We let everything pass by us, and then we complain,” said Lynda Blackmon Lowery, who marched in Selma at age 15 and says she was one of the youngest marchers beaten on the bridge. Young said they came up with the idea to march from Selma to Montgomery at the funeral for Jackson, to make a voting rights statement and to protest Jackson’s death. Shocking images of the police beatings were broadcast nationwide; ABC interrupted its Sunday night movie, “Judgment at Nuremberg,” to air 15 minutes of uninterrupted footage from the Selma attacks. Eighty-four people were injured in the violence, including Lewis, who suffered a skull fracture. In 2004, Fowler confessed to a newspaper reporter that he shot Jackson. He said he fired in self-defense after Jackson hit him on the head with a bottle. In 2010, Fowler pleaded guilty to second-degree manslaughter and was sentenced to six months in jail. A few days after the Bloody Sunday assaults, King led a second march to the scene of the violence. 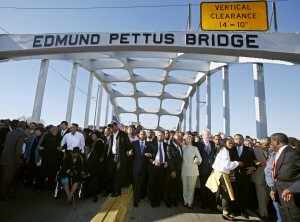 A third march, on March 21, actually made it from Selma to Montgomery. Eight days later, President Lyndon Johnson spoke to a joint session of Congress, and compared Selma to some of America’s Revolutionary War battles. Five months later, Johnson signed the Voting Rights Act of 1965, which ushered millions of African-Americans and other minorities onto voter rolls in the South.